Actor Wil Johnson is a native Londoner as a teenager he had no interest an acting career it was just by chance that a drama teacher pushed him to be part of a school production after the lead dropped out and as he says, “the rest is history”. A long and accomplished career started with his first professional acting role in 1985 in a play called Four Seasons at the Edinburgh Festival Fringe. Following that he had varied roles which includes Casualty and London’s Burning, before landing detective Stevie Johnson in the London Weekend Television series Anna Lee. He played the supporting role of Detective Constable Skelton in Cracker from 1994 to 1995. In 2000, the BBC television pilot Waking the Dead followed, and he played Detective Sergeant Spencer Jordan, a member of a specialised police unit investigating “cold cases”. Waking the Dead returned for a complete series in 2001, and Johnson became a main cast member. Since then he has appeared in drama series Clocking Off as Steve Robinson, two series of the BBC’s Babyfather. In 2004, Johnson played Othello at the Royal Lyceum Theatre, he was Marcus Kirby in the BBC drama Waterloo Road. In 2011 as ‘Sean Dolan’ a Consultant paediatrician in BBC One’s Holby City and in 2012 he joined Emmerdale as single father Dominic “Dom” Andrews leaving the soap in 2014. His film credits include in 2010, In a Better World (film) as Dr. Najeeb, in 2008 as Big Man in Adulthood, in 2013 he appeared in thriller Life Outside. In 2013, he co-produced with Christian Ashaiku a film called Disorientated Generation. In 2016, he appeared as the Earl of Kent in the Talawa Theatre Company production of King Lear. In 2018 he was in Winsome Pinnock’s Leave Taking at the Bush Theatre. Some may not know that he is a respected DJ playing alongside the likes of Artful Dodger and events such as ‘MonologueSlam’ event (actors showcase) at The Green Carnation cocktail lounge where he was the special guest DJ. Wil Johnson is currently on stage in the West end stage production Sweat as Brucie. Firstly, congratulations on this role, I have to say we have been fans of your work over the years as far back as Babyfather, amazing- Tell us where you started out with your training and what was your first job? Do you prefer working on the stage or screen? I love both mediums because each brings with it its own unique challenges which I relish. Also, it depends on the part. There must be a sense that I could fail in this role and that’s when I know where the challenge is. The ‘Thing’ that will help me to grow as a performer. Tell us about your character in Sweat, what motivates him and is there anything you relate to? Brucie is a forty something working class man who unfortunately has been out of work for nearly two years when we meet him in the play. A series of circumstances has changed his life dramatically and we meet him, we meet a man at a crossroads. Without giving too much away, we are very very different which I love because that pushes you as a performer to ‘Become someone else’…. What excites you most about this production? The script/story where it’s set (Reading Pennsylvania) playing an American role. An extremely brilliant cast and working with the uber talented Lynnette Linton our director and the opportunity to work with Lynn Nottage, a two-time Pulitzer prize winning writer…so many elements. How are the rehearsal going, and how do you prepare for each role, is it a different experience each time? Are you a Marvel fan if so do you have a favourite Marvel movie? Two elements. An amazing story and an incredible part. Tell us a bit about the Sweat storyline, what can the audience expect from the production? If I tell you..I’ll have to kill you…lol…The audience can expect to experience a good story…. As a seasoned actor, are there any roles that you would like to play? What advice would you give to anyone entering the profession? 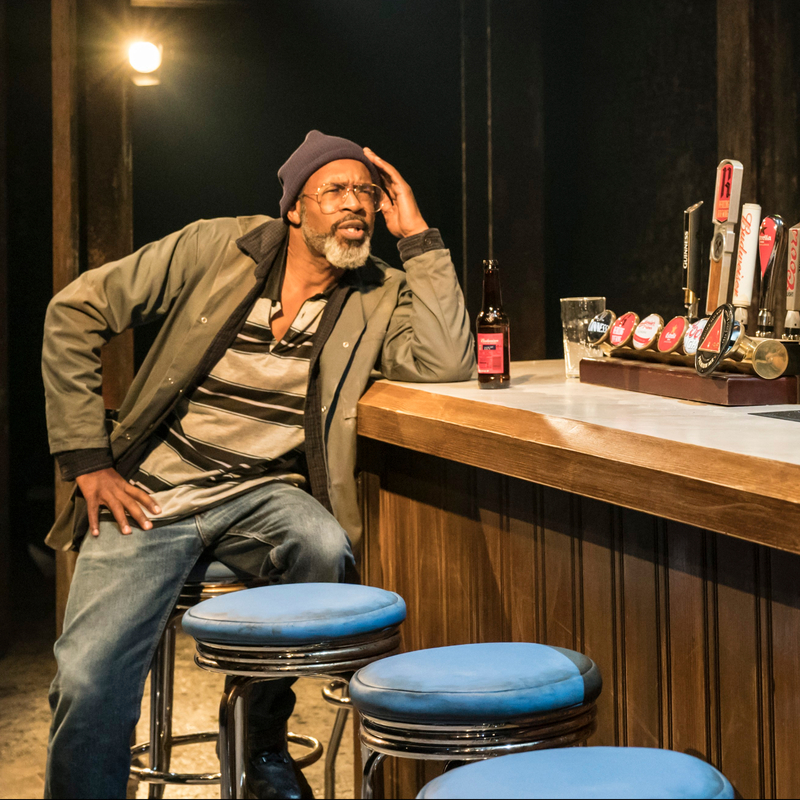 Sweat is on a the Donmar Warehouse until 2nd February due to popular demand it has an extended run.